We left California on a Sunday night and now we are to Friday of the following week, June 8, 2018, the twelfth day. All of us slept in the same room and we ate our breakfast there. We packed up and left our luggage in the room. No one would stay there that evening, so we could come back to get it that night. We were about 400 yards from where we would catch our train, more of a train stop in the town of Alnmouth, very close to Alnwick, the latter pronounced "Annick." We walked to a bus stop and I had enough cash to pay for a round trip ticket into Alnwick. The little country road on which we stayed and walked to the bus stop had no sidewalk. We stayed as far over to the side of the road as we could and the few cars that came by could see us from a distance. To our right were fields, some with gardens, and quaint houses on both sides of the road. Off in the distance, we could see the North Sea, in proximity to Alnmouth. We took the bus West about twenty minutes on rolling hills, where sheep often dotted the green grass. We considered this a sort of relaxed day, because we were going to one location, Alnwick Castle, and its gardens. After exiting the bus, it was a little walk to the entrance of the castle and then up a very long driveway to its front. We were arriving right as it would open. There were not many people there, perhaps 30 people total at that time of the year and that day. To the left of the road up to the castle was a wooded area and to the left were green fields down into a valley (as pictured below, photo taken by me). We walked uphill to the castle, which looked very much like a castle. It was as castley as a castle could be. From both inside and outside Alnwick Castle gave spectacular views. It was cold that day. We stood outside freezing really, waiting for our tour guide, slightly under dressed still with jackets on. I thought the tour was the best of the trip, all included with the ticket. We started within the walls, but not yet in the castle itself. An older, thin, funny Scottish sounding gentleman gave the outside portion and he gave a great explanation of castles, how they functioned, including living there, working there, and the defense. He told the history of this area and how the castle played in it. 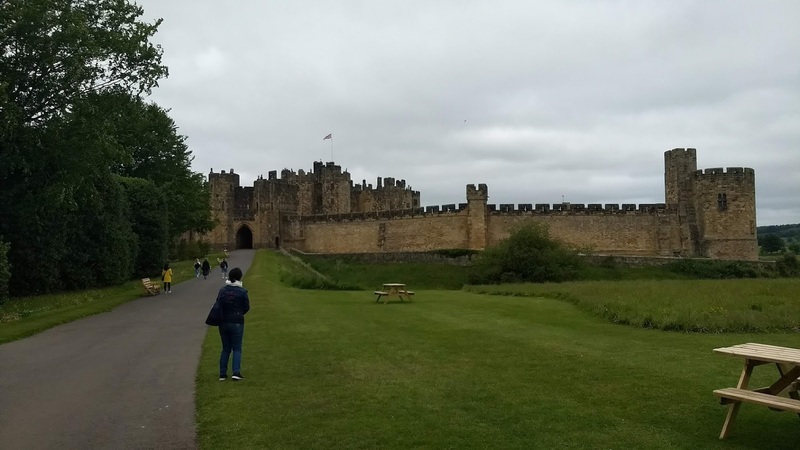 Alnwick Castle has been in several films. It's one of the most filmed castles in all of England. The tour guide was a major player there, long time employee of the Duke and Duchess, and he had been there for some of the film shoots. Directors and producers told him there was no bad shot there and nothing that needed to be done to the place. There are only 31 dukes in the UK and Ireland, some of which are royal dukes, who do not go back so far. They are all part of the royal family. Ralph Percy, the Duke of Northumberland, is 19th on that list. We couldn't take pictures in the house. The Duke and Duchess live there six months of the year. They would live there longer except for all the visitors. We asked the staff how many people the castle would house, and they answered, 300 or so. We asked how many lived there now. They said, two. Only those two people live in the whole gigantic castle. There are a lot of staff that come every day and work there, but only those two live there. My wife really liked the interior and mainly because people lived there. This was their furniture, how they had it decorated. If you wanted to get a good idea of the interior, you could see the 2015 and 2016 Christmas episodes of Downton Abbey. It wasn't something of which we knew, but they had a room where you could sit and watch the castle scenes of those two episodes. It is in the film as it is now. Everything seemed the same. Two notable furniture pieces came from the Palace of Versaille. They are original, Louis XIV, furniture pieces, picked up by a former Duke in a sale after the revolution. It was not then popular to live in a palace and be a King. Once they started attempting to put together the Palace for tourism, those two pieces were sold. They don't really fit the decor of the castle, but when we later saw the Palace on the trip, they did fit Louis XIV's palace. We ate there at the castle that had its own food service. English food. I mentioned in a previous post the bangers and mash in Yorkshire pudding. I ate that there, and loved it. It's my kind of food, when I get to eat it, which I don't, because I try to live healthy. It reminded me some of the sourdough bowls at Pier 39 and Fisherman's Wharf in San Francisco. You ate the meal and the bowl. The bowl is Yorkshire pudding. Pudding? It's no Jello brand, American pudding. This is pudding in England. This is the best use of the banger, a very mild, plump sausage, rather than at the English breakfast. 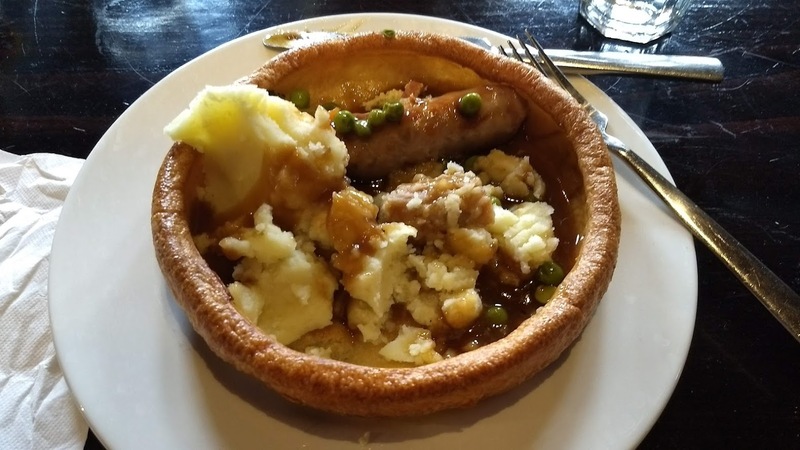 It does quite nicely with a bite of mash with gravy and some peas mixed in. This does seem like a strange meal at a tourist place, but perfect for very far north in England. The gardens were an idea of the present Duchess, perhaps to make the castle even more of a destination, to help pay for the place. They were gorgeous, not worth the price of admission, but if you've gone all the way there, you may as well visit. The fountains are spectacular and most interesting was the poison garden, where every plant was poisonous. I don't know how many, but all sorts of them to varying degrees of poison, even deadly, with a tour by an English gentleman. He didn't need to say, don't touch. No one was touching. We walked back to town after our visit and ate at a local Italian restaurant. We really did get there in time to sit, eat, and get to the bus in time to get our luggage at the house and get back to the train stop, except that European restaurants again are very slow. They aren't even trying. We sat a long time before the waitress came the first time, a long time for our still, not sparkling, water, a long time to actually order, and then a longer time to get the food. It's a super long wait for the check. They just refuse to bring it. We missed the bus. We made literally the last bus, which gave us less than thirty minutes from the bus stop to get the luggage and make it back to the train stop. My wife stayed at the train stop near the bus station and my two daughters and I ran the 400 yards to the house and back, the return trip with the luggage. We made it. Our evening train ride was from Alnwick to Edinburgh, pronounced, Edinborough. There were great views of the sea. We arrived after 9pm and were a little confused as to where our bus was. We walked a ways further into town. 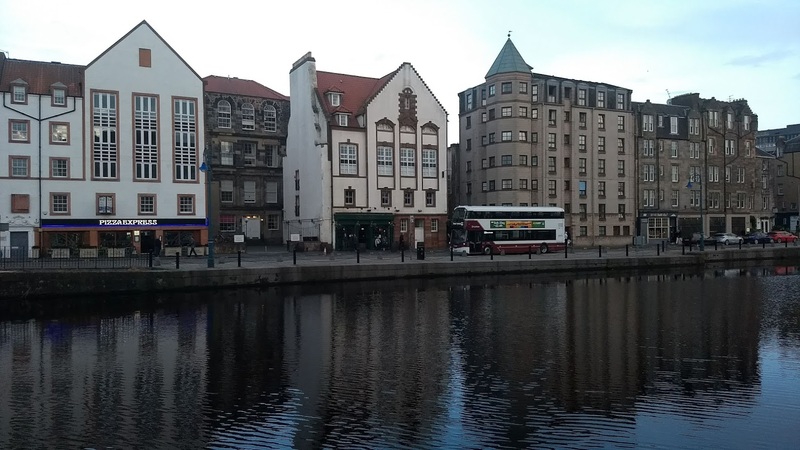 Edinburgh is unique as a European city. Years and pollution gave its stony buildings a dark hue, which gives it greater appearance of age. We took the bus about ten or fifteen more minutes to Leith on the water there (where we stayed, just to the right of the Pizza Express in my photo). The next morning we would rise and take a bus back into the center of Edinburgh, starting with another castle.